I live in Texas and we are required to collect sales tax. How do I collect sales tax from distributors (Amazon, BN, Ingram, etc), if I’m not selling the book on my own? Or do I only remit sales tax for sales I produce or have control? Thank you for reading this and I disappointed I missed the opportunity to see you in June 2013 at a Texas conference. 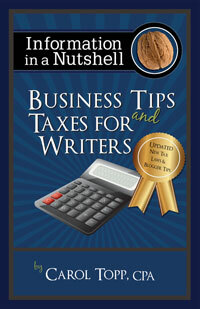 In Business Tips and Taxes for Writers I have a chapter devoted to sales tax. It’s a subject in the news a lot lately as states start to tax digital products and remote sellers. Selling to someone other than the end user. Generally, states only tax sales on the final user, so if you are selling your books to a bookstore or catalog, you do not charge them sales tax. The store or catalog will collect sales tax from the final purchaser. How do you know if a customer is the final user? Customers who intend to resell your books should present you with a resale certificate or a wholesalers license. So, your sales to a distributor are not subject to sales tax, because they are a middle-man, not the final purchaser of the book. The distributor will collect the sales tax from the final purchaser and remit the tax to the appropriate state government. This is one reason why sales to a distributor are easier on the author! No sales tax headaches! P.S. The upcoming Guide to Indie Publishing 2014 will have a chapter written by me devoted to the topic of sales tax and recent legislation that you’ll need to know about. It will be released October 31, 2013. Pre-order today.